On an unseasonably warm mid-October afternoon, Daniel Parson strolled through the fields at the Oxford College Organic Farm, pointing out interesting varieties of vegetables—including the delectably named North Georgia Candy Roaster winter squash—and recalling the series of events that brought him to this place in the sun. Parson (right) runs the Oxford Organic Farm, an eleven-acre piece of land adjacent to the campus that provides produce for the university’s dining halls and farmer’s markets and unique learning opportunities for students. Although the farm is only a few years old, the land has a long Oxford history. The property was purchased in 1948 by iconic Oxford figures Marshall and Fran Elizer. Marshall Elizer held various teaching and administrative roles from 1946 to 1978, and Fran Elizer served as library assistant. The Elizers lived on the property until 2004, when Oxford alumnus Trulock Dickson 72Ox 74C purchased the property, assuring them they could return at any time. After Marshall Elizer passed away in 2009 and Fran Elizer in 2011, Dickson donated the property to Oxford. Emeritus Oxford Sociology Professor Mike McQuaide, who retired last year, spearheaded a feasibility study that showed the land could be profitable as an organic farm, and efforts began to transform the property. 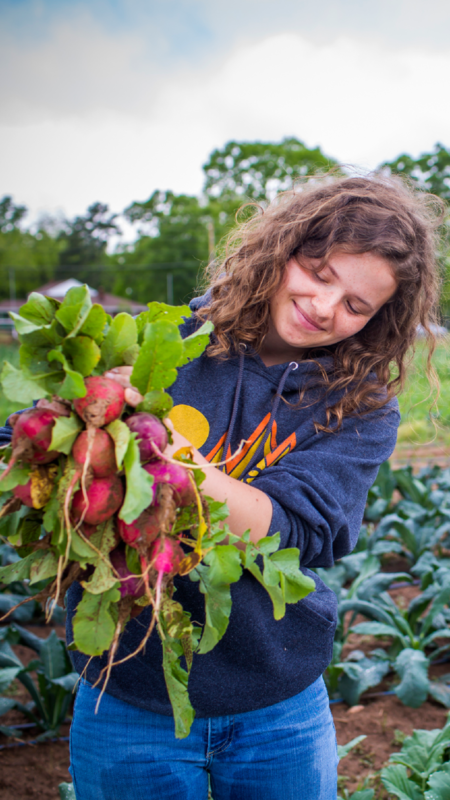 Nature Calls: Oxford students harvest vegetables from the farm. Parson joined Oxford in January 2014 with a master’s degree in plant and environmental science from Clemson University and more than a dozen years working in organic farming in Georgia and South Carolina. 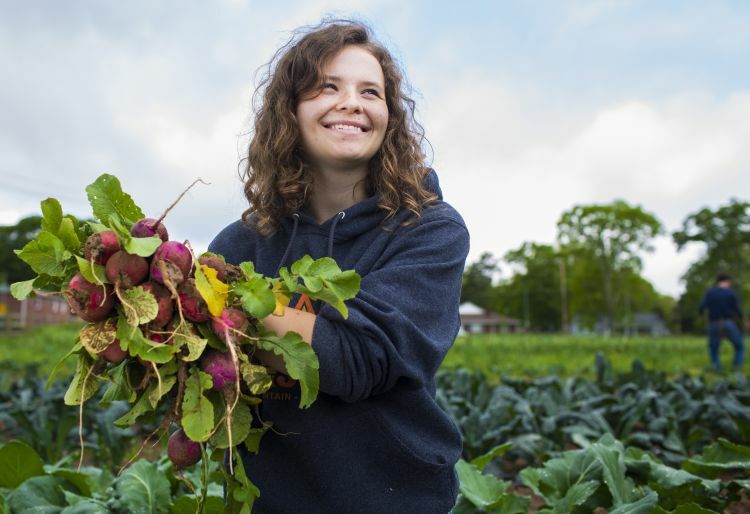 It was as an undergraduate biology major at Clemson that Parson recognized the tremendous disconnect between environmental sustainability and traditional agriculture. “We look at nature as wilderness, but we also need things from nature and we need to learn how to get them without destroying it,” says Parson. When he first took over stewardship of the Oxford Farm property, Parson tested the soil, adding lime and planting cover crops to prepare the land for planting. Now the plantable land is divided into ten quarter-acre blocks that are planted in rotation throughout the seasons, with a “hoop house”—a moveable greenhouse-type structure—that can be used to shield crops to extend the growing season, plus orchard space. “We’ve had to take a few trees down, but Emory wants to preserve trees. There’s a zero-loss policy, so whatever we’ve taken down we’ve replaced with fruit trees,” he says. 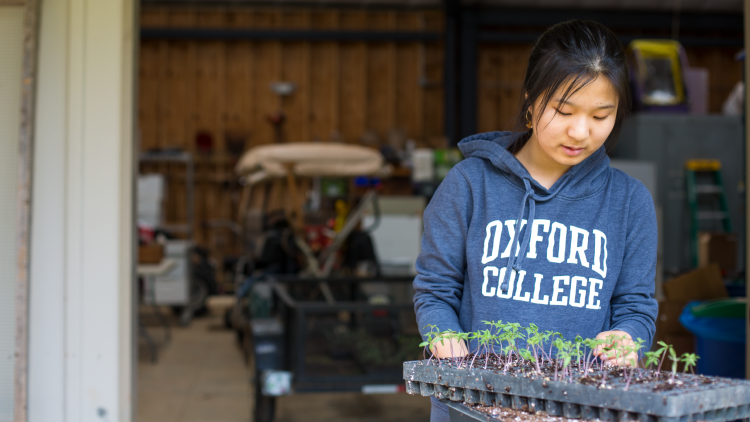 The Oxford Organic Farm is an important part of the university’s sustainability efforts. 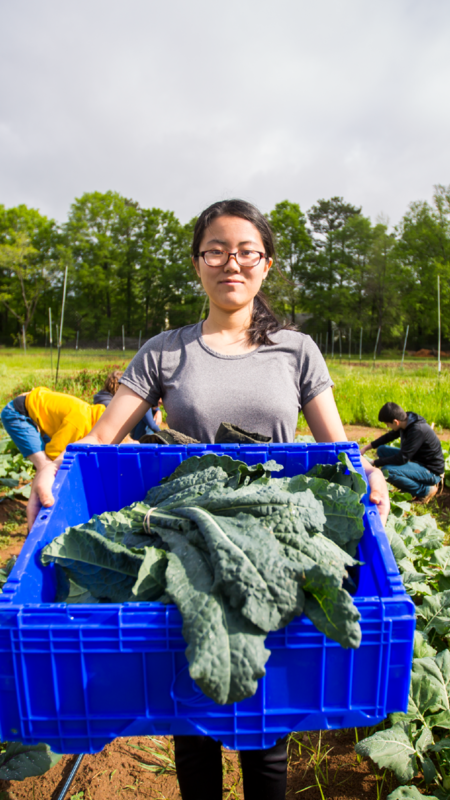 Last year it yielded twenty-five thousand pounds of produce that was sold to Emory Dining Services for use in dining halls and at weekly farmer’s markets on the Oxford and Emory campuses, and through a local Community Supported Agriculture (CSA) subscription program. 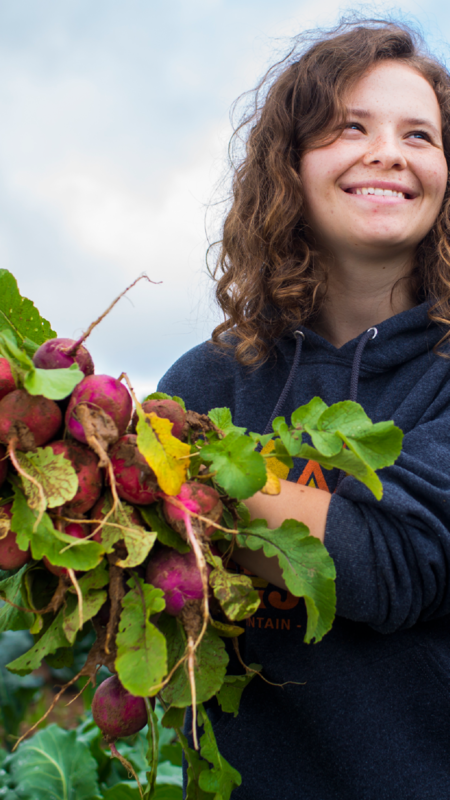 Dirty Work: Gratia Sullivan 18Ox unearths a bunch of radishes destined for the campus kitchens and community consumers. If you are going to grow something, you may as well grow something with flavor. Parson welcomes the opportunity to grow a variety of produce that is much more diverse than what can be found in the average grocery store. 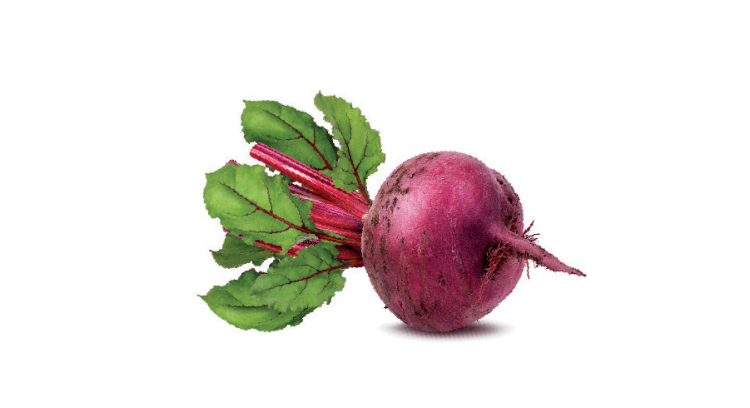 “We grow about twenty-five different vegetables and around a hundred varietals. I’ve learned many farming and growing techniques, so once you do that, you try all the different ones,” he says. The farm grows nineteen varieties of tomatoes, sixteen types of greens, ten kinds of peppers, eight varieties of broccoli, seven kinds of carrots, plus beans, cabbage, cucumbers, eggplant, herbs, squash, and potatoes, peas, beets, turnips, okra, and watermelon. 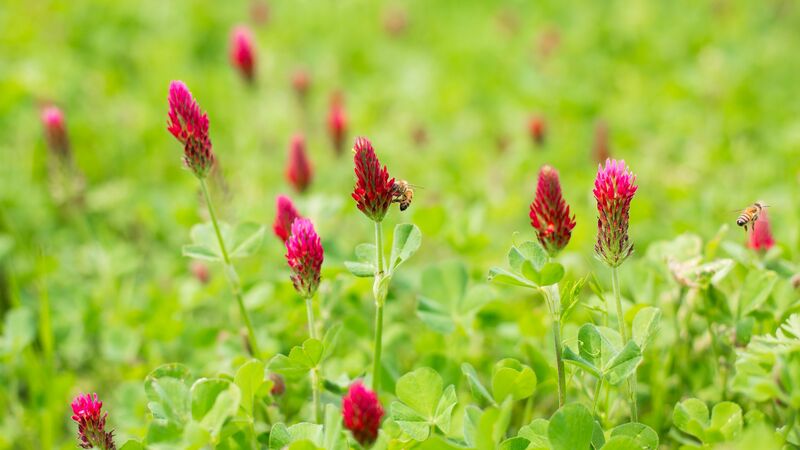 When he is not growing vegetable crops, fields are filled with cover crops of oats, buckwheat, and clover, beneficial for the beehives Parson keeps on the property, as well as legumes to conserve soil nutrients and grasses as a habitat for helpful insects. 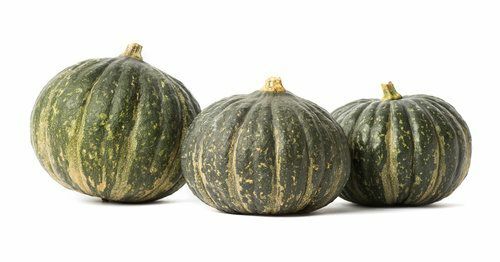 This year Parson grew a variety of African squash from seeds brought to him from Zaire by a colleague and heirloom sweet potatoes shared by a farmer at the South Carolina Botanical Garden. “If you are going to grow something, you may as well grow something with flavor,” he says. 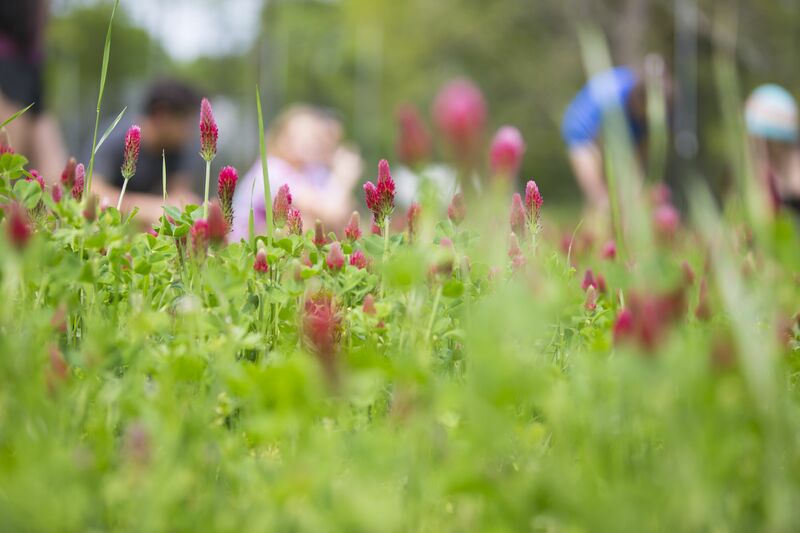 Going Local: At the Oxford Organic Farm, students (left and above) are a natural resource. 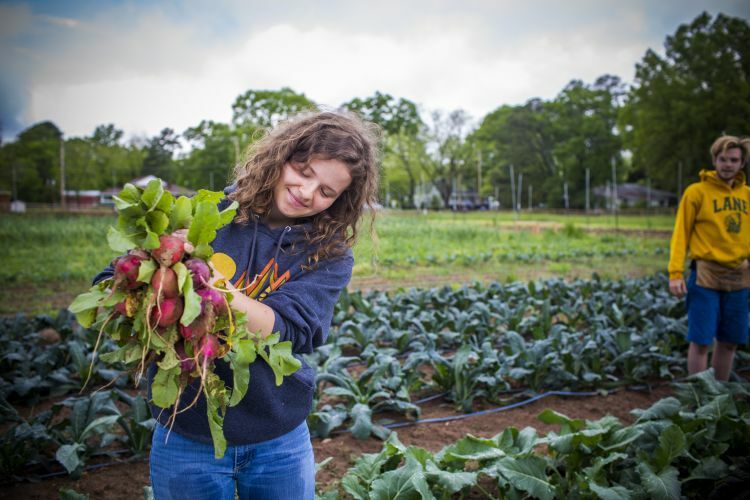 Equally important are the educational opportunities the farm offers students at Oxford and Emory, who provide much of the farm’s labor. Sixteen student workers devote their work-study hours to the farm each week, others work on the farm as a course requirement, and still others volunteer just for fun. In her Principles of Microeconomics class at Oxford College, Teresa Romano explains the concepts of perfect competition, market structure, monopoly, oligopoly, and more, teasing out how producers, sellers, and buyers all influence the economic market. Then, near semester’s end, she takes her students out to the Oxford Organic Farm to get a glimpse at how it all works in the real world. 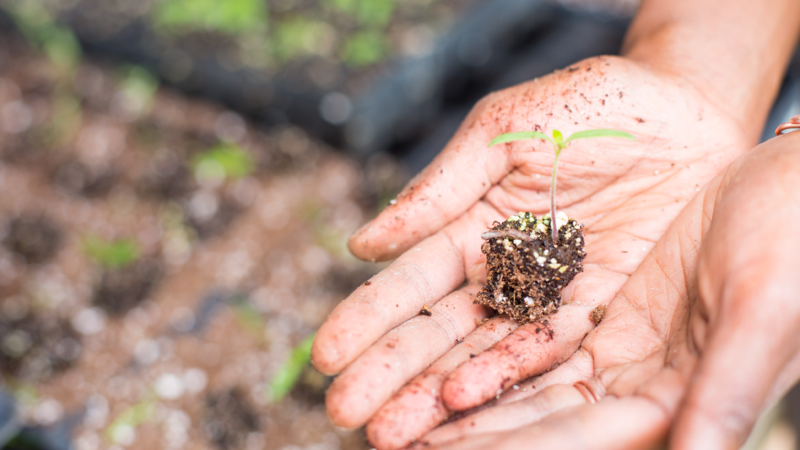 Michael Martin, a lecturer in Biology at Oxford, integrates concepts of organic farming into his Introduction to Environmental Studies course. 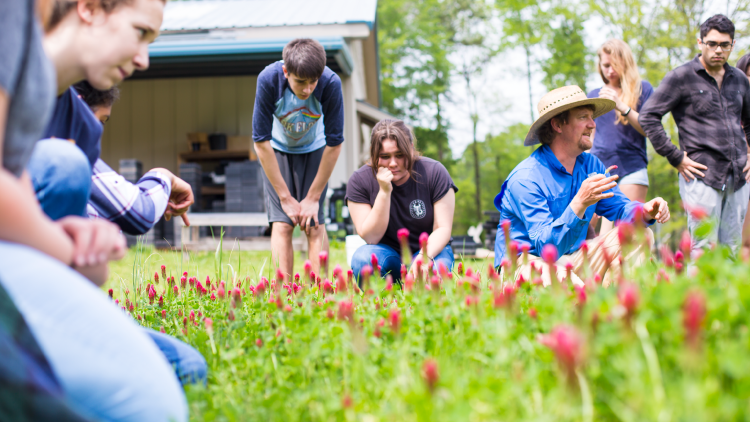 Fall semester marked the second time Martin incorporated farm-based lessons into the class, homing in on particular environmental issues students are able to observe in action at the farm. During high school in Fort Wayne, Indiana, Emory junior Eden Nitza 18Ox worked at a zoo, an experience that ignited her interest in conservation biology. Her job as a work-study student and intern at the Oxford Organic Farm helped her grasp how integral sustainable and organic farming methods are to saving species from extinction. 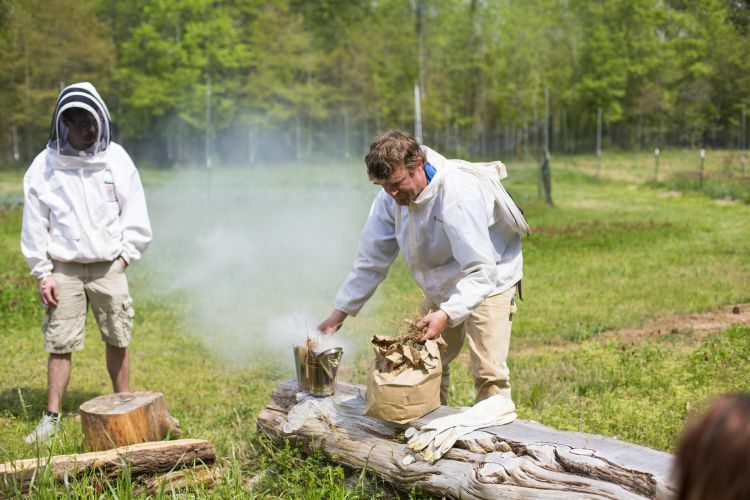 Where There&apos;s Smoke, There&apos;s Honey: Beekeeping at the Oxford farm. Nitza began working on the farm in September of her first year and spent all four semesters of her time at Oxford as a work-study student or intern at the farm. Prior to that experience, she says she was a “passive” supporter of organic farming, but did not fully appreciate the impact of sustainable agriculture on the environment. 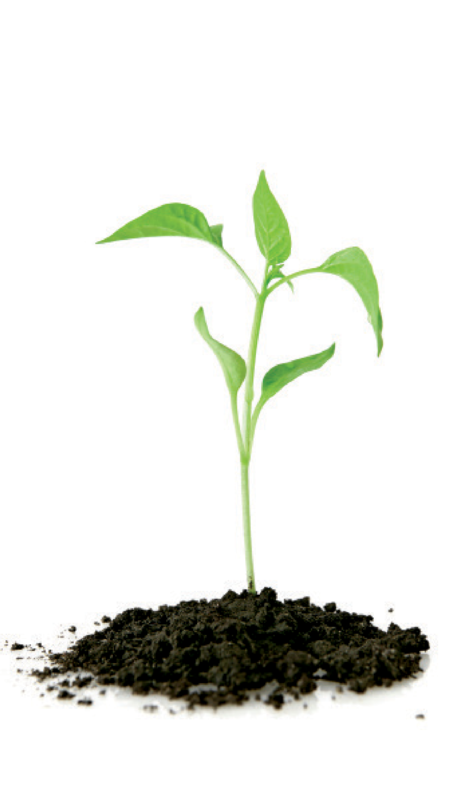 “Learning about the importance of integrated pest management and how to reduce water loss by drip irrigation versus spray irrigation teaches the value of sustainable methods better than a textbook can,” she says. 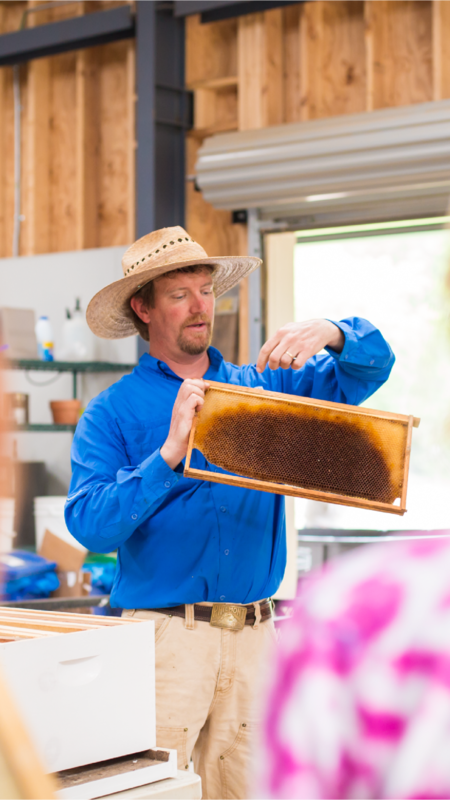 While there are natural avenues to explore the correlation between the operation of the farm and environmental science or economics classes, assistant professor of philosophy Joshua Mousie embraced the challenge to connect the farm to his environmental philosophy class. 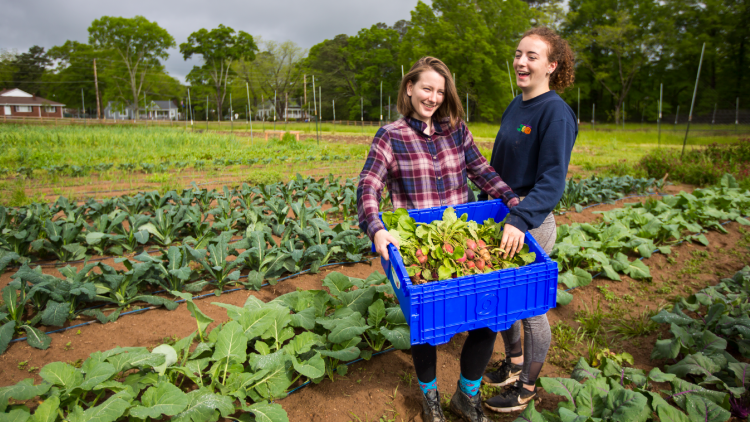 Students complete a philosophy of food project that involves reading materials on the ethics of animal and food production, globally and in the United States, then volunteering at the Oxford Organic Farm to participate in organized food production on a small scale. 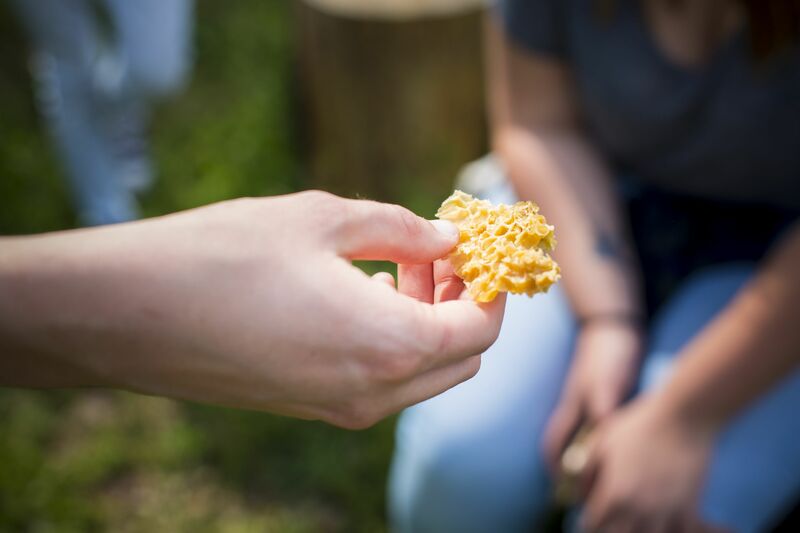 “Students synthesize their experience on the farm with the readings to reflect their own philosophy of food, responding to authors we’ve read, to give their take on the most ethical forms of food production,” Mousie says. In getting to know Parson, Mousie also discovered the farmer-scholar’s personal interest in philosophy. 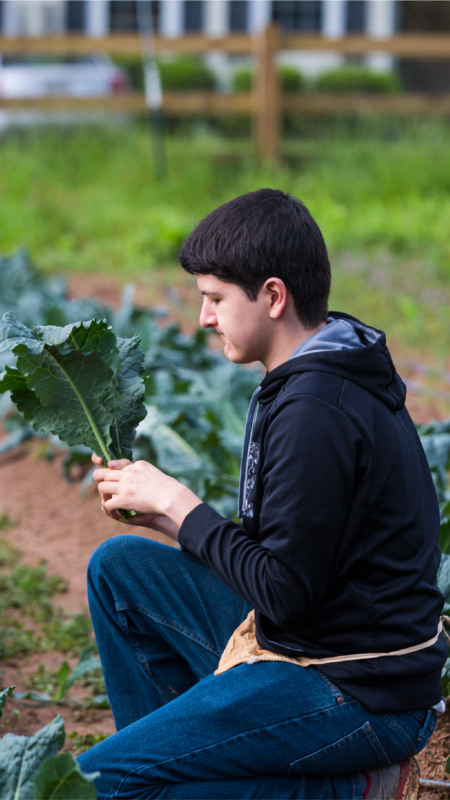 Students—some of whom have never visited a farm of any kind—have been enthusiastic about the experience. Fielding Questions: At work on the Oxford Organic Farm. 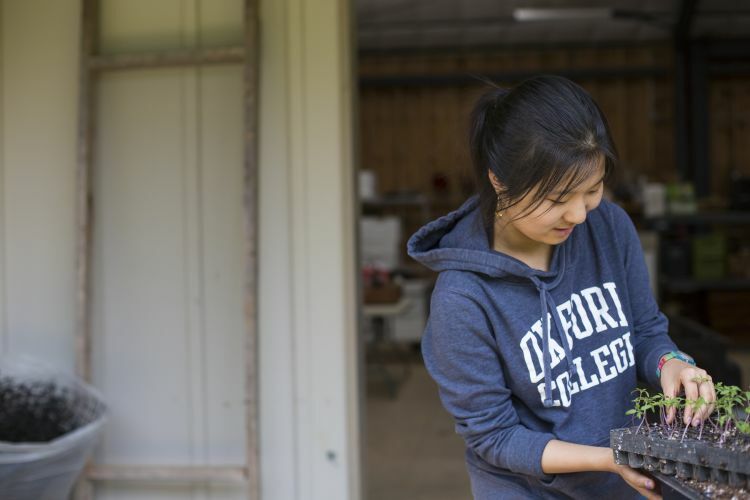 Fielding Questions: A student at work on the Oxford Organic Farm. 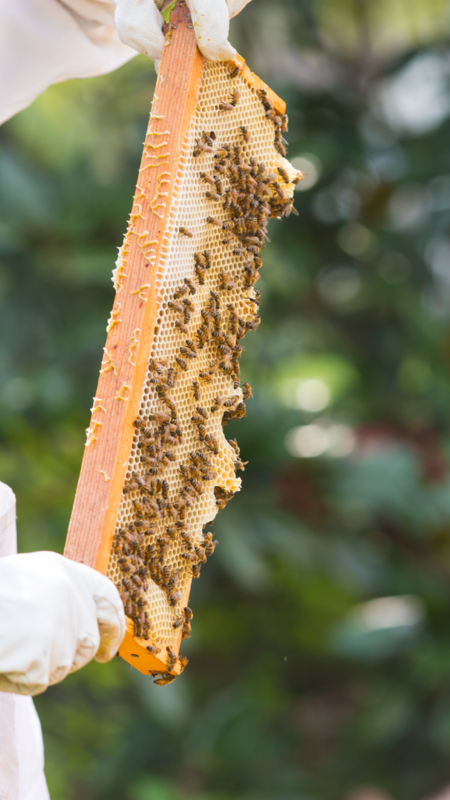 Local Honey: Oxford farmer Daniel Parson catches the buzz. Heavy Lifting: Celine Kong 20Ox pulls her weight. 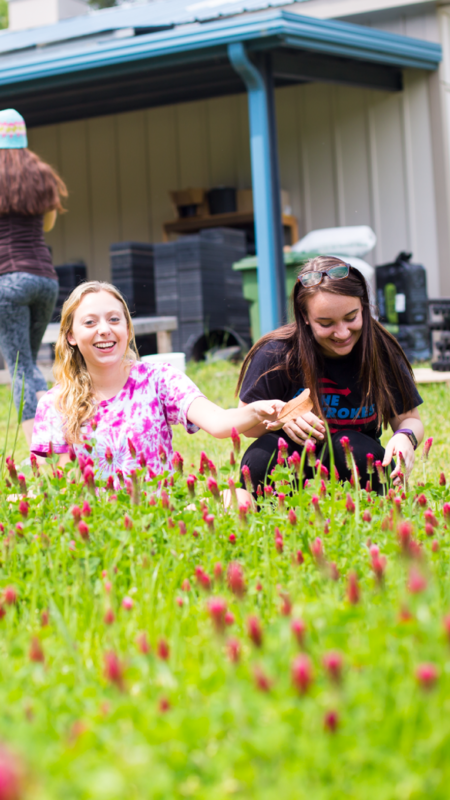 Fresh Air: Students tend flowers in bloom. The farm wasn’t up and running by the time Ruth Geiger 11Ox 13C 15MPH graduated from Oxford, but a 2015 visit to Oxford to meet with sociology professor Mike McQuade—who was instrumental in founding the farm—led to a tour of the property and an opportunity for Geiger. “At that time I was increasingly interested in the production side of food. I’d been studying public nutrition (in the Department of Global Health at the Rollins School of Public Health) and working with resettled refugees in Atlanta and connecting them with agriculture,” she says. She learned on that visit that there was an open position for a farm apprentice, so she applied. Geiger’s academic background in public health seemed a natural fit to Parson. Whose Knees Again? Fresh lettuces and greens get picked with a little help. Geiger also has created a field trip program with a local elementary school to bring third-graders to the farm to learn about organic farming. Aside from the backyard chickens and plants he tended with his mother at his family’s suburban Houston, Texas, home, sophomore Chad Coffey 19Ox 21C had no farming experience. 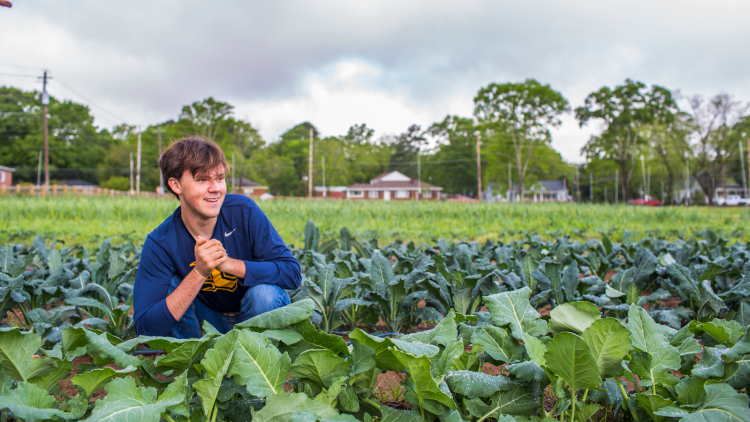 After he was accepted to Oxford, he discovered the organic farm online and knew he wanted to be involved before he even set foot on campus. 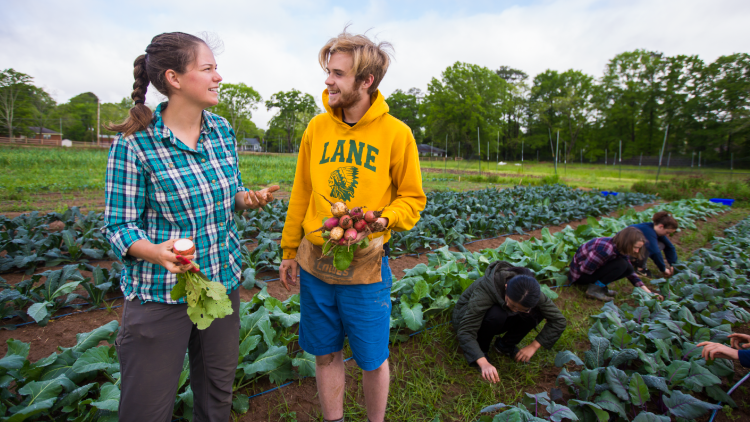 The community of student workers and the opportunities they’ve had to explore and pursue ideas and projects at the farm have been formative for Coffey. 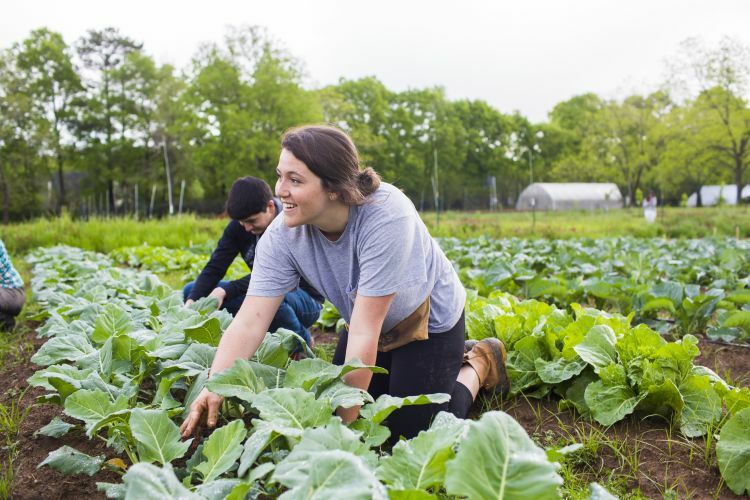 “It’s more than picking vegetables and learning how an organic farm works, and more than the social aspect, though I’ve met my closest friends working on the farm,” Coffey says. He and another intern help Geiger with the field trip program by planning educational activities and making proposals for new projects at the farm that can be used for education. Please visit Emory Magazine, Emory University, Oxford College and Emory News Center.